Barney Brogan: In 1975, he led the once smaller U.S. auto brand to hire agency Dancer Fitzgerald Sample. DETROIT (AdAge.com) -- Barney Brogan, a retired advertising manager for the Toyota auto brand, passed away Nov. 22. Brogan, 85, joined Toyota's marketing department as ad manager in late 1970 from American Motors Corp., where he had the same title on the Rambler brand. He was a virtual one-man marketing department at a then much-smaller, one-brand Toyota Motor Sales USA, which tapped Dancer Fitzgerald Sample, New York, as agency of record in 1975. In early 1976, the agency's first work broke with the tagline, "You asked for it. You got it," which ran for nearly four years and was followed up by "Oh, what a feeling!" created by the same agency. The latter effort, Brogan said two years ago, was his "all-time favorite" among Toyota's ad tags. Toyota's account tallied some $40 million in annual billings when Dancer took over -- and was among the largest to have changed hands at the time, recalled Earl Gandel, who joined the shop in early 1976 as account supervisor. Brogan was "the best client you could have asked for; he really believed in being partners with the agency," Gandel said. "He was a kind, honest, good man -- and very smart. If I had to use one word to describe him it would be gentleman." Toyota retiree Bruce Campbell, who worked with Brogan, said both of them were part of a Toyota retired alumni group that met for lunch monthly. He described his former colleague as "a class act." 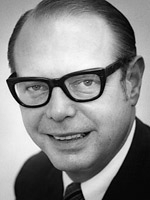 After his stint as national advertising and sales promotion manager, Brogan moved to director of public affairs before retiring in August 1987. He remained active and gave a speech in September at an AMC enthusiast classic car show in Southern California. He is survived by his wife, Bonnie, who has asked that, in lieu of flowers, any donations should be made to Manhattan Beach Community Church in California. A memorial service will be held Dec. 12 at the Manhattan Beach Community Church, 303 S. Peck Ave., Manhattan Beach.